7” one-piece forged s/s blade, bolster and tang for extra strength. Genuine Pakka wood handle and leather sheath. After a good day’s fishing, there is nothing better than filleting the catch, with a good quality, razor sharp filleting knife, with a quality, flexible blade. Equally, there is nothing worse than hacking away with a blunt, second rate knife – a quality knife simply makes all the difference and every fishing bag or kitchen should have one! 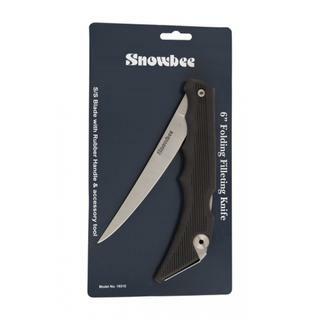 Snowbee's new range of knives offer superior performance coupled with great value for money. All the blades are forged in 420 grade stainless steel for flexibility, razor-sharp edge and long life. 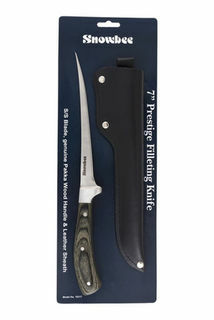 19315 6” Folding Filleting Knife 6” stainless steel blade with rubber handle. Fold-out de-scaler and kidney blood removal tool. 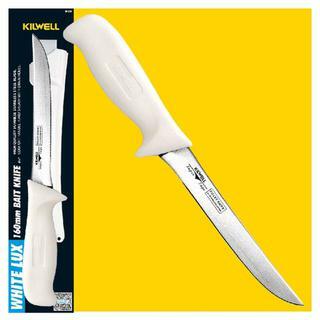 Make quick work of any fishy task with a sharp, Whitelux knife from Kilwell. The blade is made from quality Japanese high-carbon stainless steel for long lasting sharpness and corrosion-resistance. The ergonomic hygienic handle is designed for ease-of-use with textured sides to promote a comfortable cutting grip. The supplied hard plastic sheath is fitted with a belt loop and drain holes. Available in three models; 210mm wide blade fillet, 200mm flexi fillet, and 160mm wide blade bait knife. All Kilwell Whitelux Knives carry the Kilwell Lifetime Warranty.